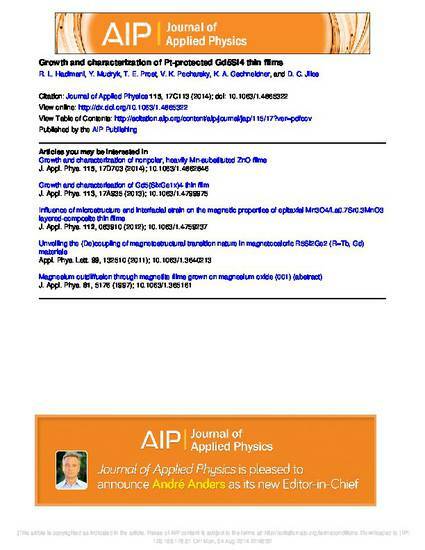 Successful growth and characterization of thin films of giant magnetocaloric Gd5(SixGe1−x)4were reported in the literature with limited success. The inherent difficulty in producing this complex material makes it difficult to characterize all the phases present in the thin films of this material. Therefore, thin film of binary compound of Gd5Si4 was deposited by pulsed laser deposition. It was then covered with platinum on the top of the film to protect against any oxidation when the film was exposed to ambient conditions. The average film thickness wasmeasured to be approximately 350 nm using a scanning electron microscopy, and the composition of the film was analyzed using energy dispersive spectroscopy. X-ray diffractionanalysis indicates the presence of Gd5Si4 orthorhombic structure along with Gd5Si3 secondary phase. The transition temperature of the film was determined from magnetic moment vs.temperature measurement. The transition temperature was between 320 and 345 K which is close to the transition temperature of the bulk material. Magnetic moment vs. magnetic field measurement confirmed that the film was ferromagnetic below 342 K.
The following article appeared in Journal of Applied Physics 115 (2014): 17C113 and may be found at http://dx.doi.org/10.1063/1.4865322.